Dairy-free (and gluten-free) coffee lovers…REJOICE!! So Delicious has done it again. No surprise…because they are awesome. Now…this is not new news to any of my fellow So Delicious and coffee lovers…but back in mid-2014, So Delicious Dairy Free put out a small line of shelf-stable coconut milk coffee beverages that are intended to be chilled and then enjoyed by the vegan and lactose intolerant (and even those dairy-lovers) alike. And, my friends over at So Delicious were kind enough to send me a 4 pack of one of these new coffee beverages! I. LOVE. THEM. Anyone who sends me a dairy-free coffee beverages (especially a latte) WINS in my book. So…even more love to So Delicious! With every intention of devouring them around the time I got them…life happened. And when life happens, the best laid plans often don’t happen. So, this amazing pack of four sat in my pantry…and sat…and I’d think, “I’m traveling this weekend, I need to bring those…” And then I didn’t. For the first time in forever, I took steps to remember to bring these little gems on the road with me, by setting them aside with other items I knew I needed to pack up for the journey from Indiana down to Birmingham, Alabama to visit my family. They made the trip with me (finally) and I put them in my parent’s fridge that evening so they could chill, and the four ladies who were venturing out that morning for some shopping could have a caffeine hit before facing that challenge. The plan worked like a charm. That morning, after a good breakfast, my mom, my sister, my roommate and I each grabbed one of the So Delicious Dairy Free Cococcino Latte Chilled Coconut Milk Coffee Beverages from the fridge, gave them a shake to mix, and were on our way. I was the first to crack mine open. I was the first to down a bit of it. I should have said, “So delicious!” HAHAHA! (Oh, the ways I amuse myself). So, here is the lowdown. I have grown to love coffee ever since I was a Starbucks barista. When I started at Starbucks, I hated coffee. Everything about it. But suddenly…I it was my world. I smelled it. People asked my opinion on it. So…slowly…I grew more accustomed to it. First…the frou-frou blended drinks…then the mochas…then the lattes…then coffee. Now, I brew a cup for myself at home…no cream…no sugar. It took YEARS to get there…but that’s where I am. But when I’m away from home…café au laits and lattes are all that I want from the local and chain shops I find along the way. The So Delicious Dairy Free Cococcino Latte Chilled Coconut Milk Coffee Beverage has that pure coffee goodness that people who drink lattes want. You drink mochas if you don’t like the taste of coffee…you drink lattes if you do. I was, actually, the first in the car to polish mine off (my mom was done first, but I really don’t think she drank hers…just sayin’) because it was just that good. This bit of coconut milk based coffee goodness is not too sweet and not too overwhelming on the coffee flavor. My sister loved hers as well. My roommate said that it was alright, but she’s not a fan of cold coffee (which she says…then orders cold coffee at times…so…yeah…). It was convenient to have, amazing to try, and delicious in the end. Totally would buy these and stock my pantry with them for those busy mornings where I just don’t have time to wait on my coffee to brew. Super tasty! Now, let’s talk ingredients. 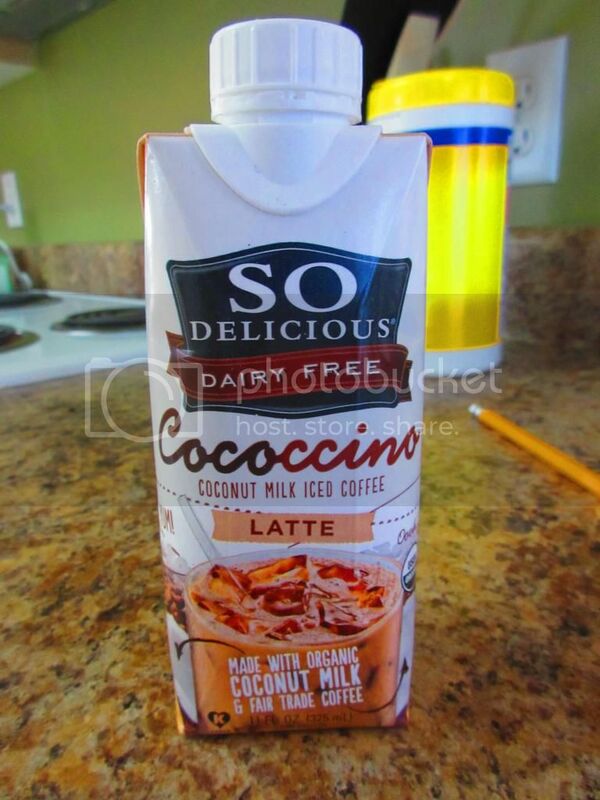 The So Delicious Dairy Free Cococcino Latte Chilled Coconut Milk Coffee Beverage is made from organic fair trade coffee, organic coconut milk, organic dried cane syrup, organic vanilla extract, natural flavor, sea salt, potassium chloride, calcium phosphate, organic guar gum, xanthan gum, and monk fruit extract. True…there are some…not-so-natural sounding ingredients making these not-so-much a clean eating staple…but definitely a splurge every now and again. These coffee beverages of coconut milk awesomesauce are always certified dairy-free, vegan, gluten-free, and non-GMO. And now…nutrition. Hang onto your knickers, friends. Because these 11 ounces will fill you up with fewer calories than anything you could get at Starbucks that even remotely resembled this. A full serving is one single-serve (11 ounce) container. This serving will give you 130 calories and 4 grams of fat. This serving also provides 150 mg sodium and 22 grams of sugar. That…is high, I know. This drink is cholesterol free. And, finally, you’ll be consuming 2 grams of fiber and 1 gram of protein. Like I said…coffee lovers rejoice. You don’t have to be gluten-free or dairy-free to love these little boxes of coffee goodness. You just have to be someone who loves coffee and a little variety. As for me…I’m definitely smitten. This entry was posted in Breakfast, Clean Eating, Coffee & Tea, Drinks, Gluten-Free, Products, Review, Sweet Stuff, Travel, Vegan, Vegetarian by The Celiathlete. Bookmark the permalink. haha I’m going out today so I probs will pop one in the trolley 😉 hehe!